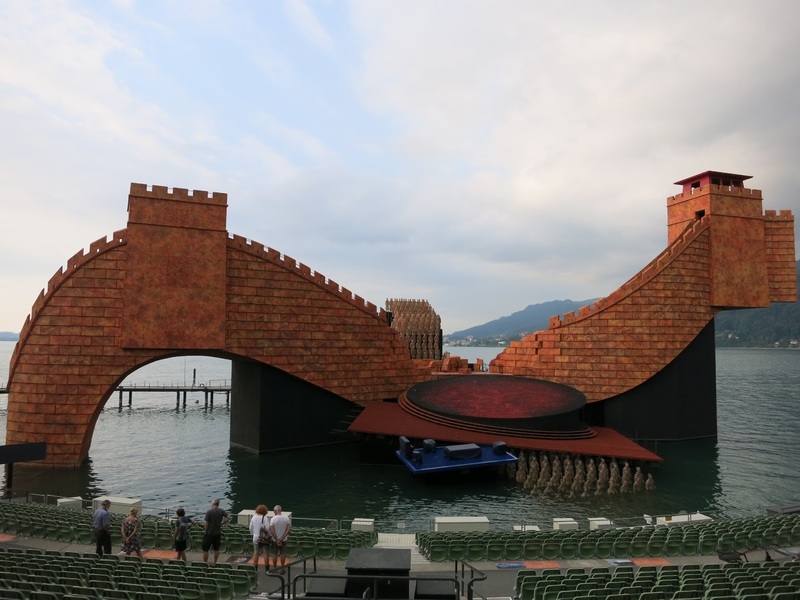 Thinking of going to the Bregenz Festival? 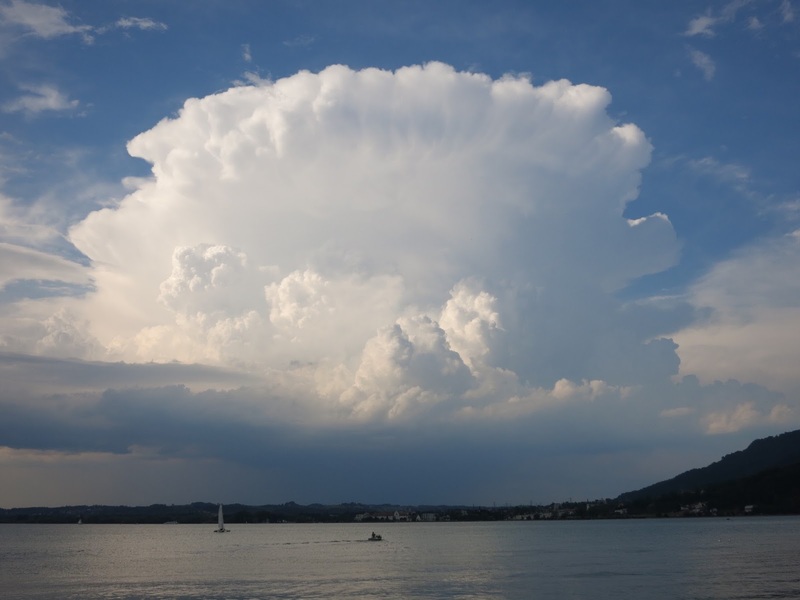 Located in the province of Vorarlberg, at the far western tip of Austria and on the edge of Lake Constance (the Bodensee in German), it’s somewhat off the beaten path. Anecdotal evidence suggests that this festival is not very popular among the English-speaking set, so I thought I would provide some information for those who may be interested. Lower right: Austria. Lower left: Switzerland. Top: Germany. There are two venues. 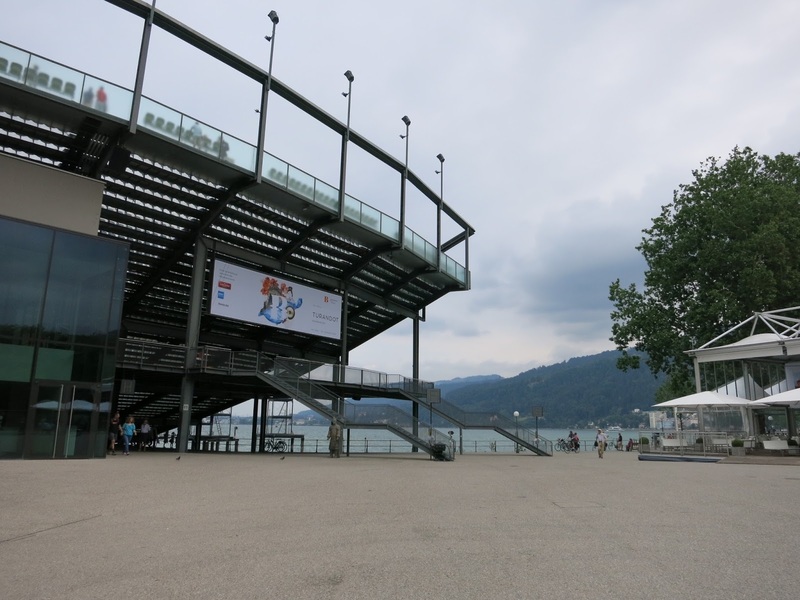 First, the Seebühne (lake stage), the huge open-air amphitheater with the stage anchored in the lake. This stage only hosts one opera and it’s the same one for two years, given a very large number of performances from late July to the end of August. 2015 is Turandot’s first year so it will be performed in 2016 too. The productions here have a somewhat upscale popular aesthetic–pitched at roughly the same level as the Met, actually–and are performed without an intermission. Here is my review of Turandot. Since it is outside, weather is a major variable. If it’s raining a bit, everything goes ahead. You aren’t allowed to use an umbrella but you can buy a plastic poncho from the kiosks for 1 Euro, a wise investment if there are any clouds at all. If the weather is truly bad, the performance is moved into the Festspielhaus and performed in concert. However, the Festspielhaus is much smaller and only the most expensive tickets include inside privileges. The seats are plastic. The festival sells cushions, but I thought they were OK. The casts for the big production rotate and who is singing which performance isn’t announced ahead of time. (This is not a star-focused enterprise.) If you are intent on seeing any particular singer, I would advise contacting the box office or the singer in question. such creativity with the “Chinese” imagery! The other venue is the Festspielhaus, a modern theater seating around 1,600. This venue hosts a few short-run productions of more obscure or adventurous opera, this year including Stefan Herheim’s staging of The Tales of Hoffmann and the local premiere of Peter Eötvös’s The Golden Dragon. There are also a few orchestral concerts with the Wiener Symphoniker. The dress code for the Festspielhaus is more consistent and formal–think suits and nice dresses, including many full-length ones. Fewer dirndls at Hoffmann than Turandot. Here is my Hoffmann review. There is also a young artists production of Così fan tutte in the Vorarlberger Landestheater. If you are staying in Lindau (see “hotels,” below), you can arrive by boat. This seemed charming but I wasn’t staying in Lindau. The festival is also a very short walk from the Bregenz train station. Tickets for this festival go on sale very early–in autumn, well before all the casting details are announced. You simply buy them directly off the website, no complicated pre-orders like Munich or Salzburg, and they do not sell out nearly as fast as those places. You can safely wait until well into the spring to make your plans and some tickets are even available now that the festival has already begun. (Weekends and cheap seats are pretty sold out, though.) It is also a relatively affordable festival, particularly compared to its neighbors in Salzburg and Luzerne. What would have put me somewhere in the darkest back rows of Salzburg’s Großes Festspielhaus got me the second row at Hoffmann. The normal tickets for Turandot are also quite reasonably priced, though the champagne-and-boat-trip type packages are considerably more. The festival is amply equipped with food and drink from restaurants and bars, and there are many pretty places to sit around the lake. Here is the festival’s website. There are some nice day trips to be had, however. Lindau, just across the German border, is picturesque. St. Gallen, home of a fantastic Baroque library, is under an hour away. Konstanz is also within reach, though I didn’t make it there during this trip. You can buy a regional rail day pass which is valid on all local Austrian, Swiss, and German trains. One other challenge is hotels. I booked relatively late but found few affordable options in Bregenz itself. If you have or rent a car you will have a much easier time. I ended up staying in nearby Dornbirn and taking the S-Bahn, which involved some waiting for trains but not too much actual transit time. There are also options in Lindau. The S-Bahn runs extra-late for the festival (an example Bayreuth could learn from!). While it’s in Austria, Bregenz is most easily approached from Zurich, though Munich is also reasonably close. * Salzburg is around four and a half hours away by train and at almost seven hours Vienna is way more distant than you would think possible for such a small country. As Destination Opera, I’m not convinced that Bregenz is necessarily worth a major trip by itself, though the Hoffmann arguably is. The program is quite narrow and it thus lacks the intensity of its more famous siblings–for the most part you can’t see four different things in a long weekend. 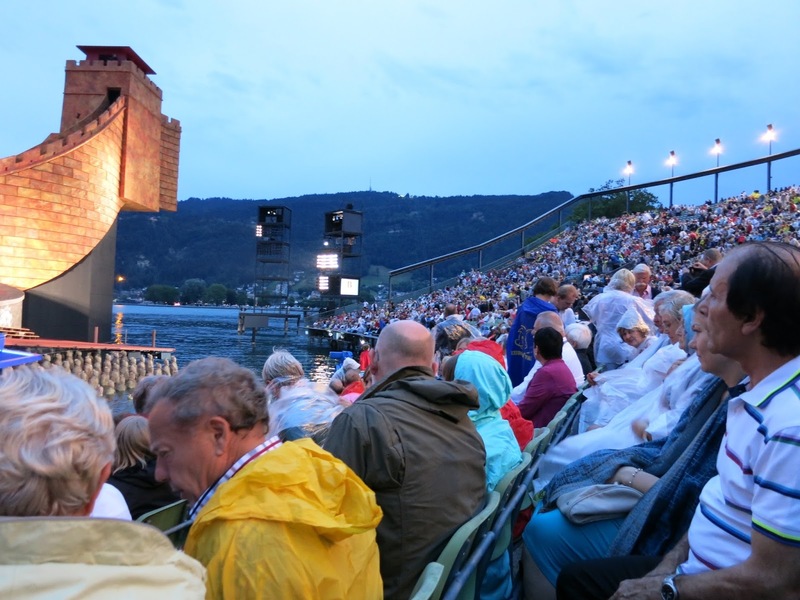 But in combination with other area festivals such as Munich, Salzburg, Bayreuth, Luzerne, or even Verbier, it’s definitely worth a look, and won’t break the bank. *If you’re coming from Munich, the REX train route is as fast as the EC so you can use the cheap Bayern-Ticket to get almost all the way there; you will just need to switch to the S-Bahn with a local ticket in Lindau. 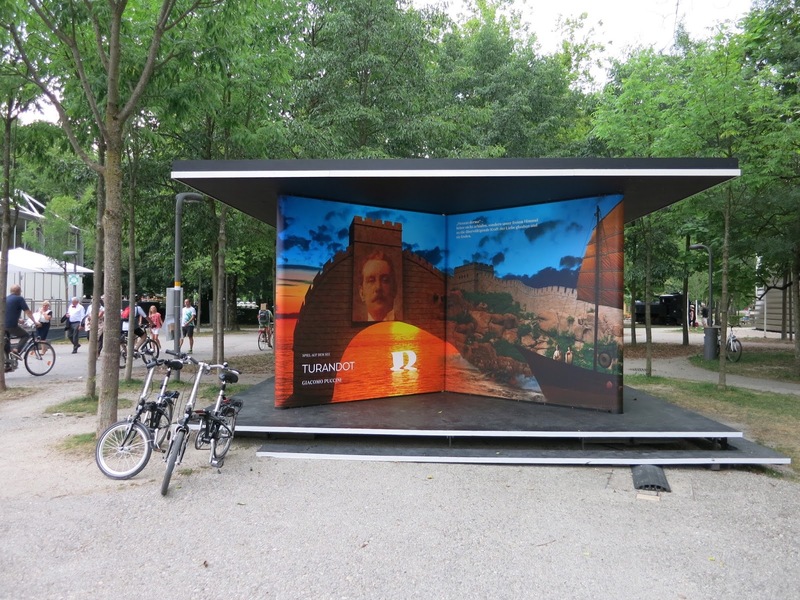 If you’re doing this summer’s mysteriously popular Bregenz-Bayreuth Regiestrecke, be aware that this may involve more changing of trains than seems reasonable. You could also do this trip on the Bayern-Ticket, but since it isn’t valid on ICE trains it might take a lot longer depending on your particular route. This has been a note from someone who has spent too much time and money on Bavarian trains. I attended “Andrea Chenier” twice in 2012, and thought it terrific. I saw “Turandot” on Sunday 26 July 2015, and sat for 2+ hours in the *pouring* rain, wearing a 1-euro poncho; at times the rain spattering on the poncho competed with the music. The performers were unprotected, and were real troupers – but I still couldn’t even bring myself to clap, altho’ the rain stopped in time for the curtain calls. I just sat there the whole time, looking as if I’d been sucking a lemon, waiting for it to end. To be fair, the audience seemed enthusiastic. I then got to Bregenz railway station in the dry, had to wait 45 mins for the special train at 12.15 am to take me 12 mins back to Lindau, then back to the hotel in even worse rain. What a waste of time! And of 50 euros. We returned to the UK the following day, and it’s taken days for me to regain my temper – and yet, I don’t really have anyone to blame. Yeah, that doesn't sound very pleasant. But, and I don't mean to be nasty saying this, if you don't want to sit outside to see opera in the rain you probably shouldn't sit outside and see opera in the rain. It's kind of part of the deal.